The history of braiding goes all the way back to Africa, where braids were used to identify a person’s tribe. Braids were also used during slavery times as maps for black people to use to escape slave plantations. “The women would weave the maps in their hair, carving out paths with their cornrows. Some patterns were even utilized to deliver secret messages.” (James, n.d.) Like many hairstyles, braids can be and are used as a symbol of liberation and creativity. Braiding hair is also a convenient style for those on the go. Great for hair growth and a huge summer look. It gives you the chance to soak up the heat during the warmer months. Braiding hair splits up into several styles from extricate plaits, twist and cornrows, as well as afropuffs styles done to the hair. With the amount of different braiding styles available out there it might be hard to choose. When summer comes round I always find myself in the same predicament, what will I do with my hair? Well for this summer, I have put together a number of suggestions for you to try out or get inspired. Below is a list of celebrities who have had a super stylish braid look. Each of the women mentioned below has used their own hair as a way to express their creativity. 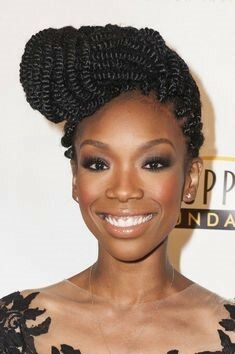 2) Brandy Norwood: American singer-songwriter wearing a twisted braid hairstyle. 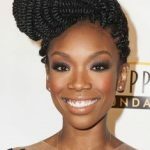 Brandy Norwood who also does acting part-time loves natural hairstyles “I love braids and twists, and I love the natural expression, that’s my thing.” (Marketplace, 2013) But also stated that she had to be versatile for acting jobs. Yaya Dacosta: American actress stunting with her natural afropuffs. The actress and part-time model usually rocks hair natural hair and wows everyone whilst she does it. (hair?, 2014)This style gives the hair rest and allows growth plus it is a low maintenance hairstyle too! In terms of haircare, Crystal who works as a stylist at Afrotherapy London states that “before you even get your hair braided you should deep condition your hair”. (Williams, 2018) This means that your hair will be moisturised and your roots will be strengthed during the braiding process. Crystal specialises in natural hair, weaves & extensions, creative colour on weaves & styling as well as relaxing and styling services. Black Beauty and Hair. (2014). Hair Crush: Mel B. [online] Available at: http://www.blackbeautyandhair.com/hair-crush-mel-b/ [Accessed 19 May 2018].James, D. (n.d.). Campbell, D. (2015). KeKe Palmer Reveals Her Hair Routine and Explains Why She Relaxes Her Hair. [online] Essence.com. Available at: https://www.essence.com/2015/07/08/keke-palmer-reveals-her-hair-routine-and-explains-why-she-relaxes-her-hair [Accessed 21 May 2018]. hair?, W. (2014). Who said there isn’t any versatility in Natural hair?. [online] ROCKIN’ IT NAPPTURAL!!. Available at: http://www.rockitnapptural.com/2010/09/who-said-there-isnt-any-versatility-in.html [Accessed 18 May 2018]. Mapping Out Freedom: Escaped Slaves Used Braids For Direction. [online] HelloBeautiful. Available at: https://hellobeautiful.com/2877570/braids-cornrows-maps-for-slaves/ [Accessed 18 May 2018]. Natural Hair Care | Rayann410. (2016). Nicki Minaj Slays the Feed in Braids!. [online] Available at: https://www.rayann410.com/blog/nicki-minaj-slays-the-feed-in-braids [Accessed 18 May 2018]. Williams, C. (2018). Hair blog. « Welcome to my lifestyle e-zine blog!